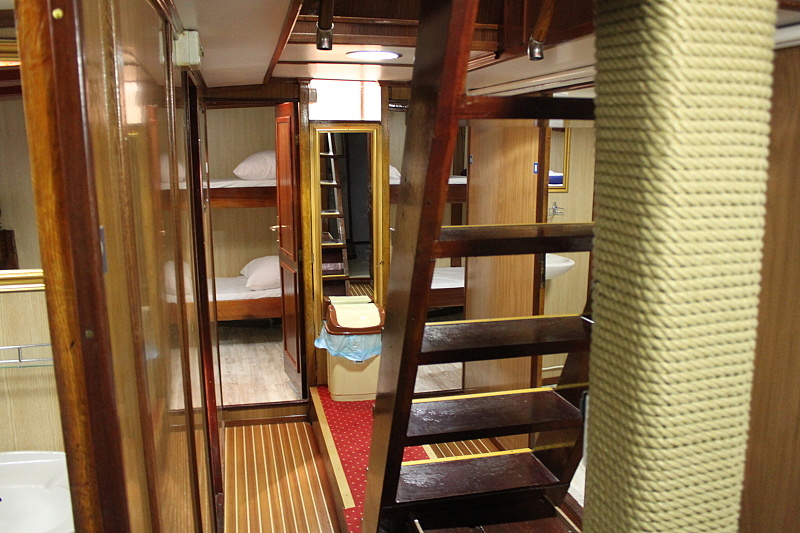 Traditional wooden yacht Silva is for maximum 28 passengers and 4-5 members of crew, captain Ante Vukovič is owner of this ship too. 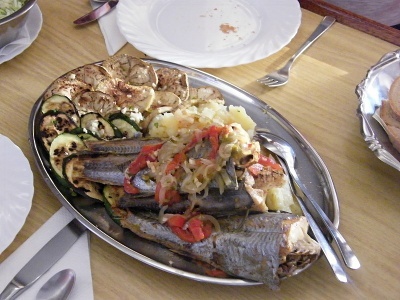 Silva is the traditional type of the Adriatic Sea ships, ie. 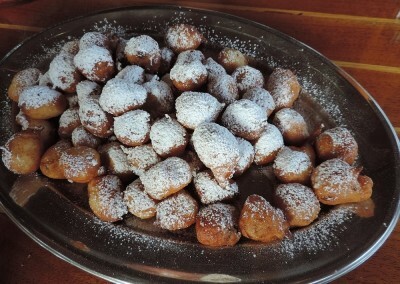 trabakul and it is unique in Croatia. Elegant, romantic, comfortable …. 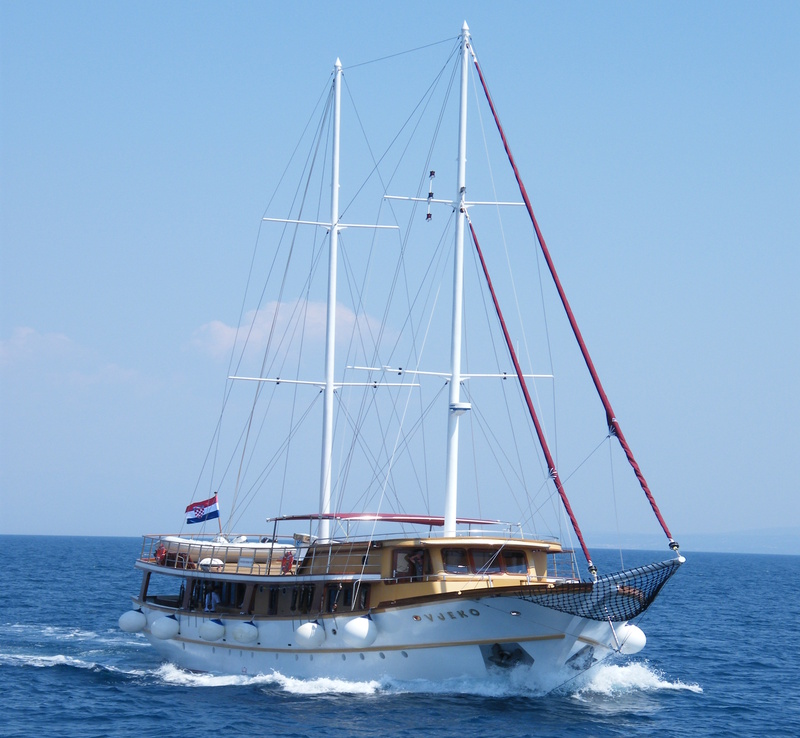 the best yacht for naturist cruises in Croatia. 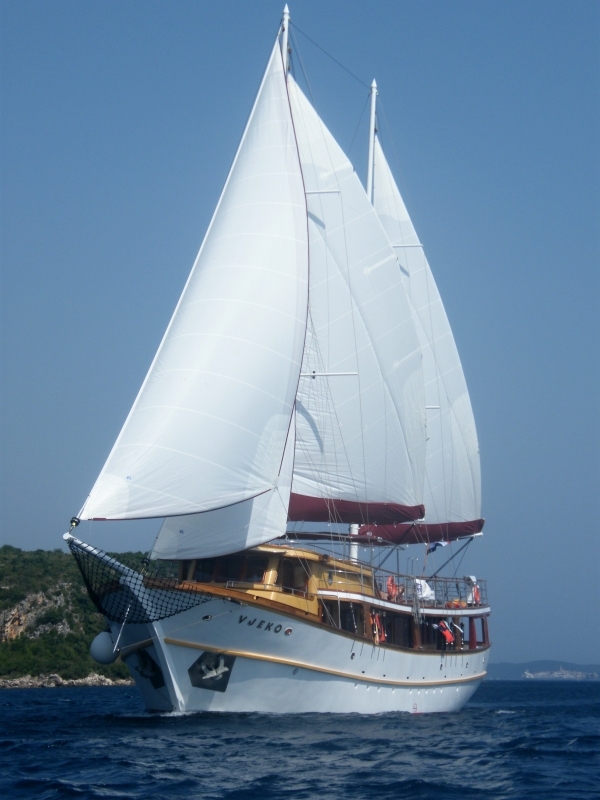 This is a yacht Vjeko. Modern motor yacht Vjeko is for maximum 21 pasengers and 4-5 members of crew, captain Ivan (or Dino) Vukovič is the member of ship owners family. 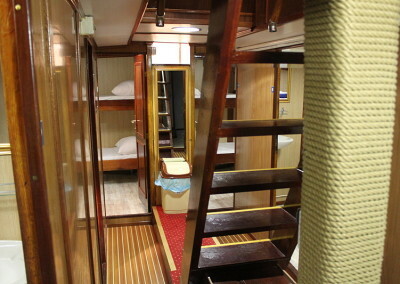 The cruise by yacht is an ideal type of a naturist holiday in Croatia. 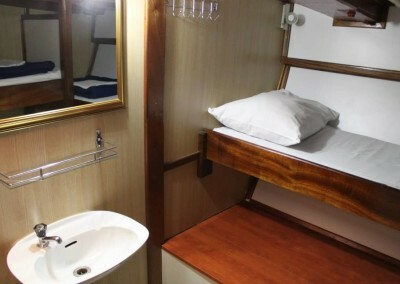 You will visit many nice places during one week, every evening a new place for overnight – mostly in the port (about 6x a week) or in some romantic bay on the anchor (mostly 1x a week). You spend your time with swimming and sun-bathing in beautiful bays, non crowded beaches. 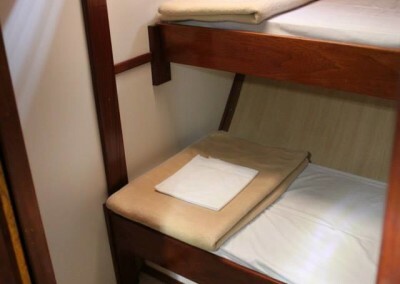 The washbasin with cold water is in all cabin. Bring your own towels. 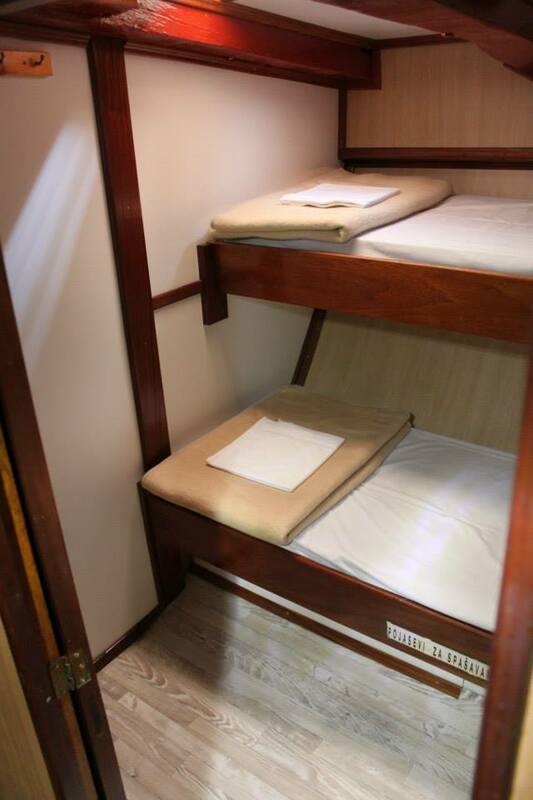 Showers and toilets are common and are on the main deck. All cabins have own sanitary (shower/WC), air-condition, porthole, safe and hair dryer. 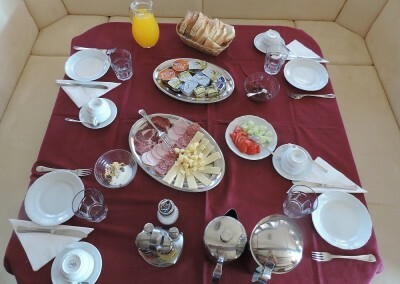 captain´s dinner on FridayThe breakfast including coffee, tea and juice, bread, butter, jam, cold cuts, cheese, yoghurt and müsli. 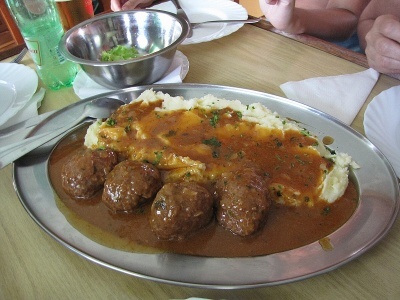 Partly also eggs, sausage. 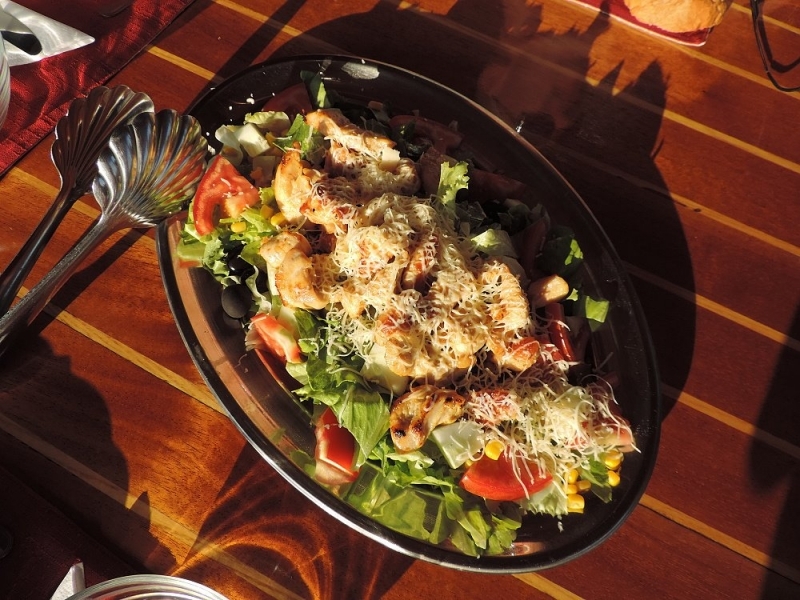 The main meals (lunch and dinner) usually consist of soup or starters, meat or fish with side dishes and salad, and dessert or fruit. 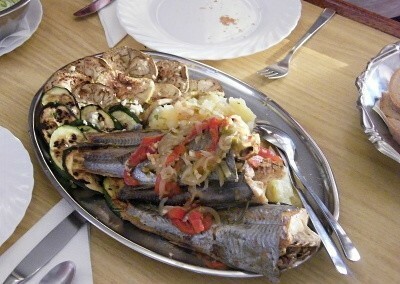 Although our tours are sea voyages, and you often will be served fish, mainly meat is on the menu.Vegetarian food is available on request − please advise us at the time of booking if you require vegetarian food. 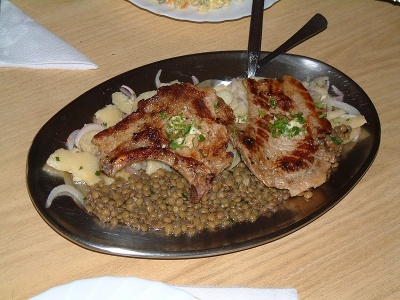 Vegetarian food does not mean that special menus are prepared; rather more side dishes (vegetables) will be served instead of meat. 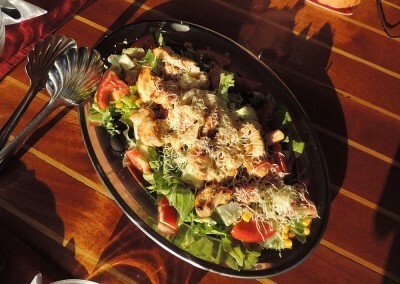 The boat bar – here you will always get cool drinks − with or without alcohol. 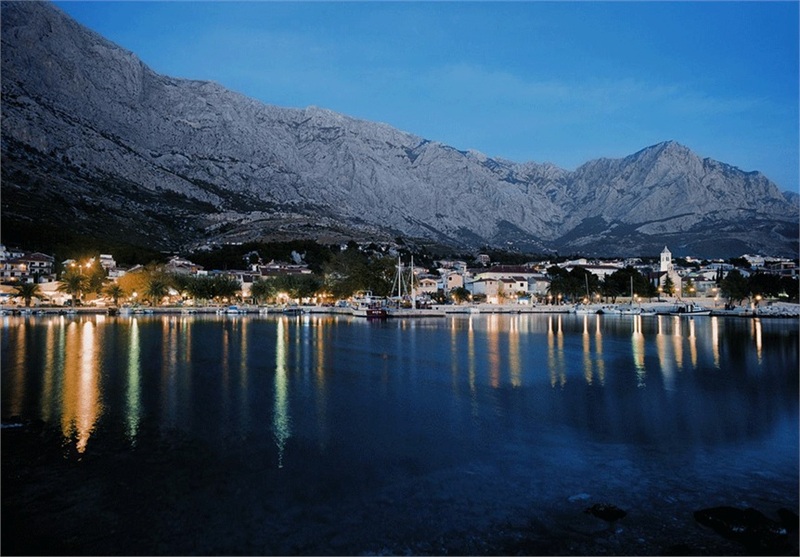 Our port for the embarkation and the disembarkation is Omiš. 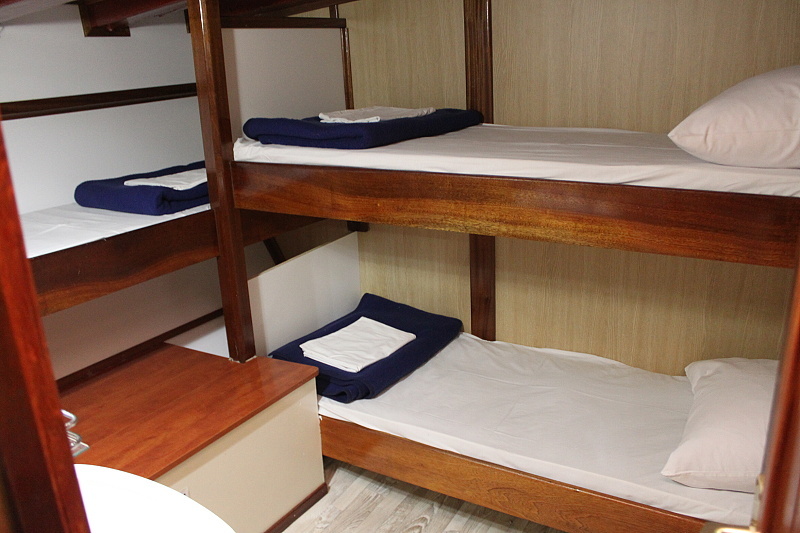 Once all guests are aboard, we weigh anchor and set off towards the first port of call. 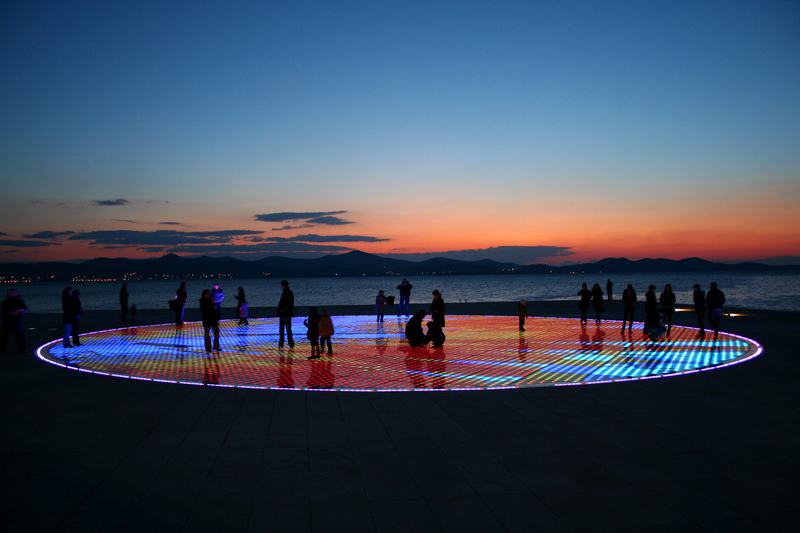 Late check-in is possible from 6:00 pm in Split or Trogir. (it depends on the route)Omiš is small historical town, about 25 km from Split and about 40 km from the airport Split. 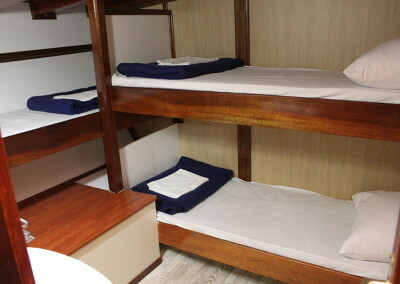 Price is valid for 1st and 2nd person – double occupancy. 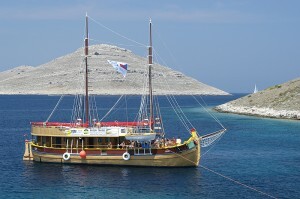 Departure from Omiš at 11:00h and than the cruising along Dalmatian coastline to Trogir with swim break in the afternoon. 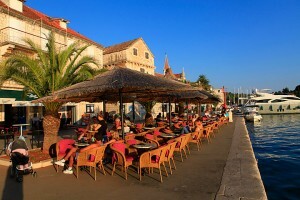 We spend the evening and the night in Trogir, the historical city under UNESCO protection. Lot of time for sightseeing of this beautiful town. 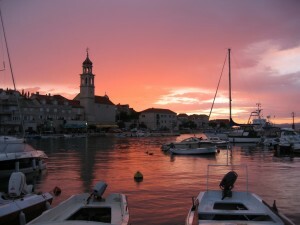 In the morning our cruise continues along Dalmatian coastline to Primošten. 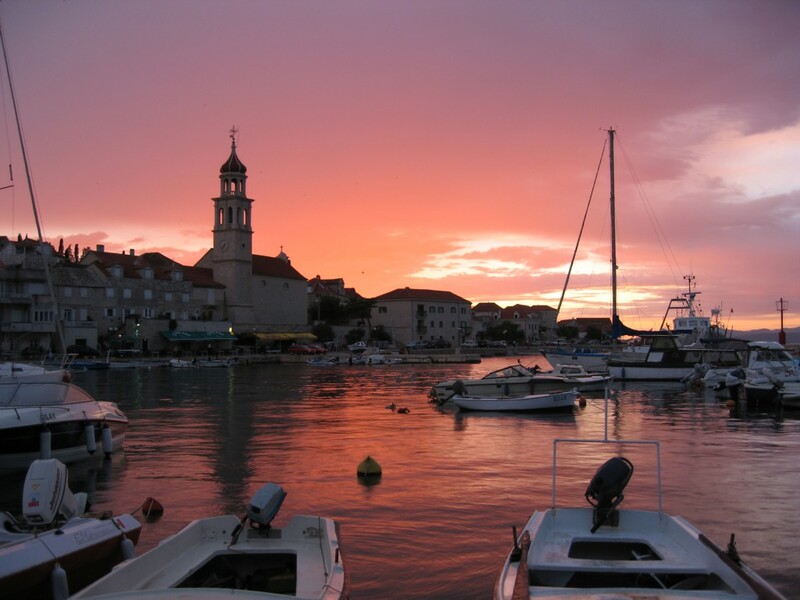 The day we spend mostly relaxing and swimming in different quiet bays and in the late afternoon we arrive to the town Primošten. 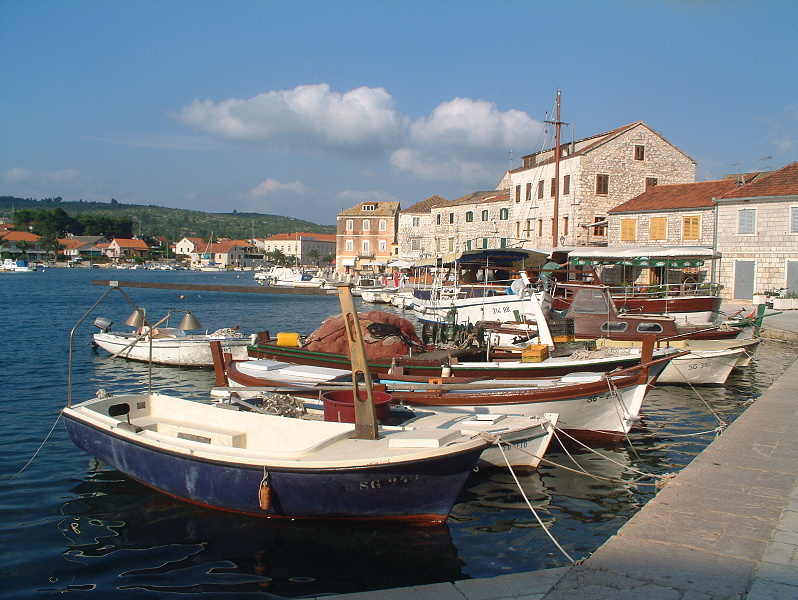 Primošten is small, very interisting historical town built on the small peninsula. Early morningt we continue around Šibenik towards NP Krka – Waterfalls. Afternoon free to enjoy the National park and the waterfalls. 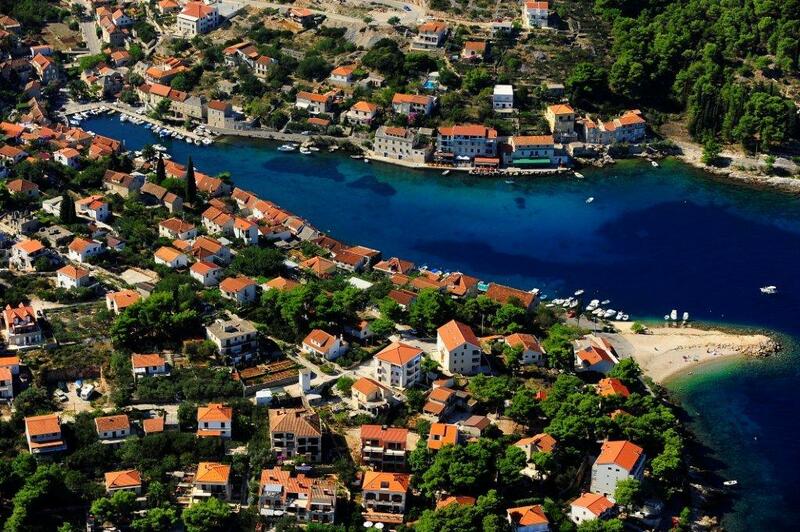 Discover the beauty of Krka, and its exceptional flora and fauna. In the late afternoon we arrive back to the historical town Šibenik. 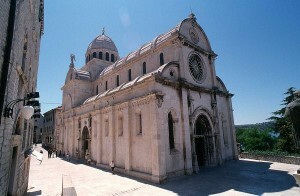 In Šibenik one can visit a castle above the town center and many beautiful historical buildings. Early morning departure towards islan Dugi otok. During the day we stop in different quiet bays for swimming and bathing. In late afternoon we arrive to Sali, small village on island Dugi otok. Our journey continues throught Kornati islands towards the coast. During the day we stop in different quiet bays for swimming and bathing. 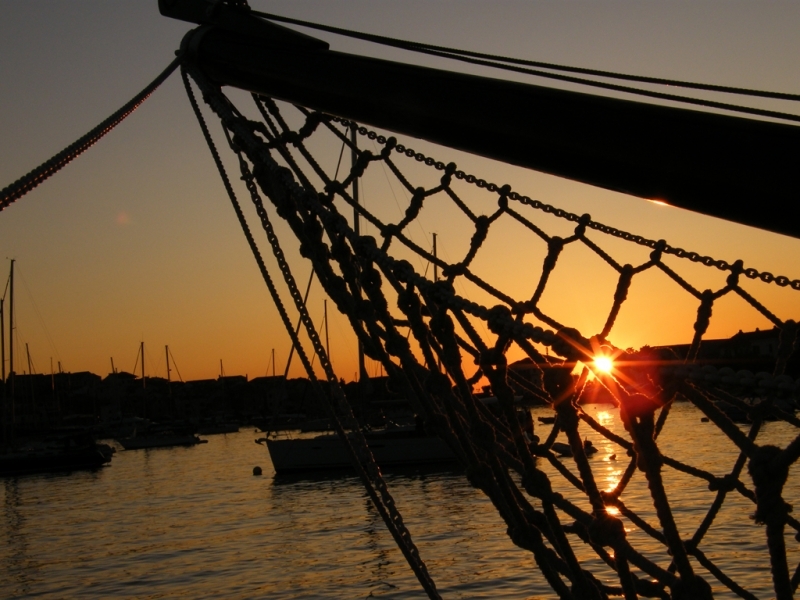 Overnight in Rogoznica. The last day we spend mostly relaxing and swimming in different quiet bays. 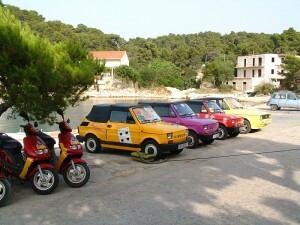 Our last overnight we spend in the small town Pučišča in deep bay on island Brač. It is the cradle of world’s famous stone of Brač. 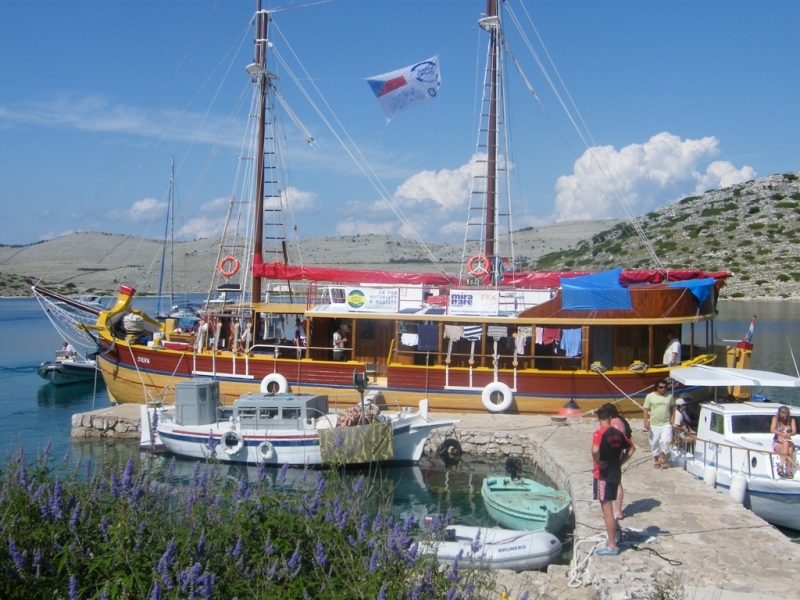 Early morning departure towards Omiš and after breakfest is the time to say good bye to the crew and all your new friends. 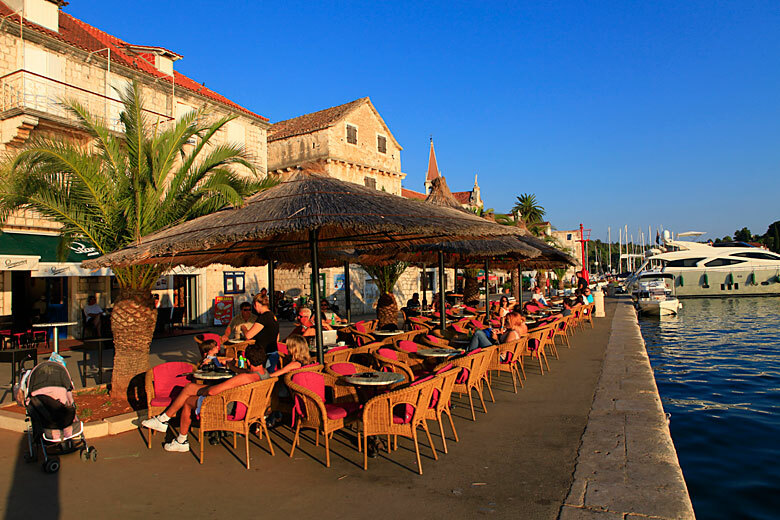 In the morning we leave Trogir and continue our cruise towards the island Vis which was closed to the tourism for many years, beacause it was strategic place for the navy. 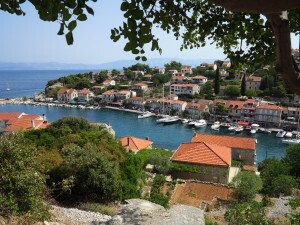 When we reach the Vis island we make a stop for swimming and bathing in the bay. In the late afternoon we arrive to the town Vis, the place with the the remains of the Ancient Roman Bath, the beautiful villas, and of course with many restaurants, bars, etc. Early morning cruising towards the island Korčula, the afternoon we spend in the bay close to Vela Luka. 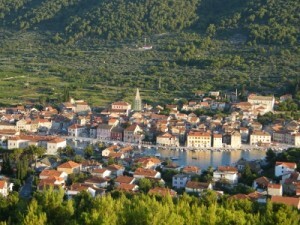 In late afternoon we move to the town Vela Luka for the overnight. Vela Luka is typical fishermen village with unique atmosphere. 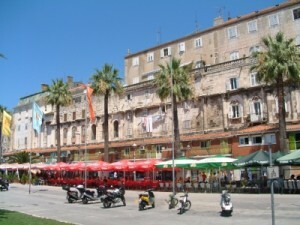 In the morning we stop to visit in the historical town Hvar. 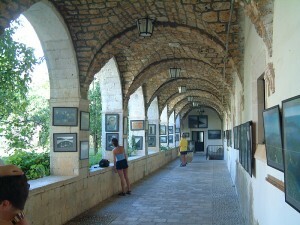 The famous Hvar is one of the most interesting places in Dalmatian. Here we can find the Renaissance cathedral with its original tower; also the oldest community theatre in Europe was founded here in 1612. From the fort on the hill above the town is fascinating view on the town and suroundings. 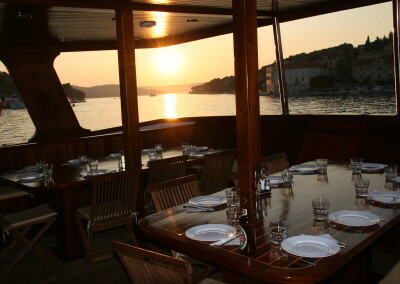 After the visit of Hvar we cruise around the island Hvar. 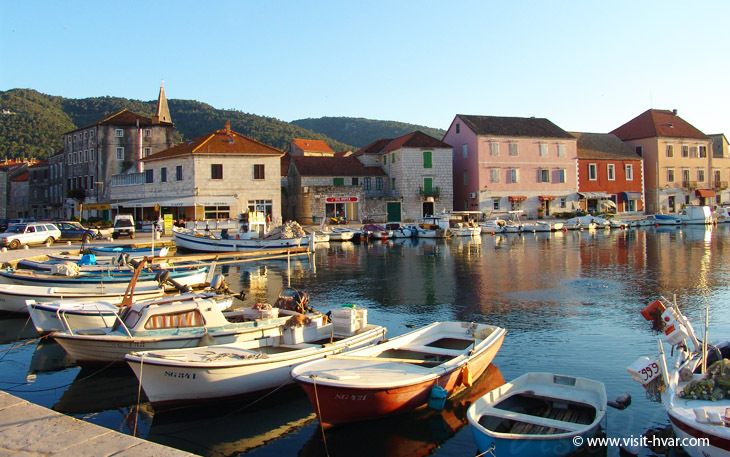 The most of the day we spend in beautiful bay and in the late aternoon we arrive to Starigrad. Stari Grad is historical heart of the island of Hvar. The town is situated in a landscape where the blue of the deep bay touches the green of the wide an famous field of Pharos, with vineyards and olive-groves. 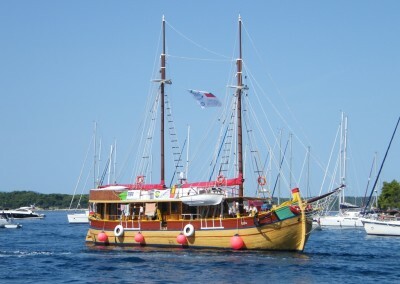 Our cruise continues around the island Hvar. 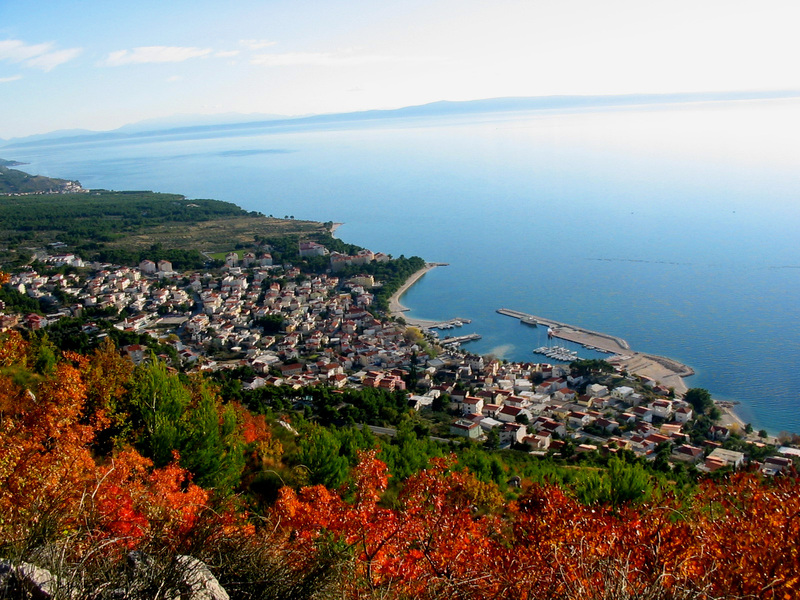 The afternoon we spend in beautiful bay and in the late aternoon we arrive to the village Jelsa. 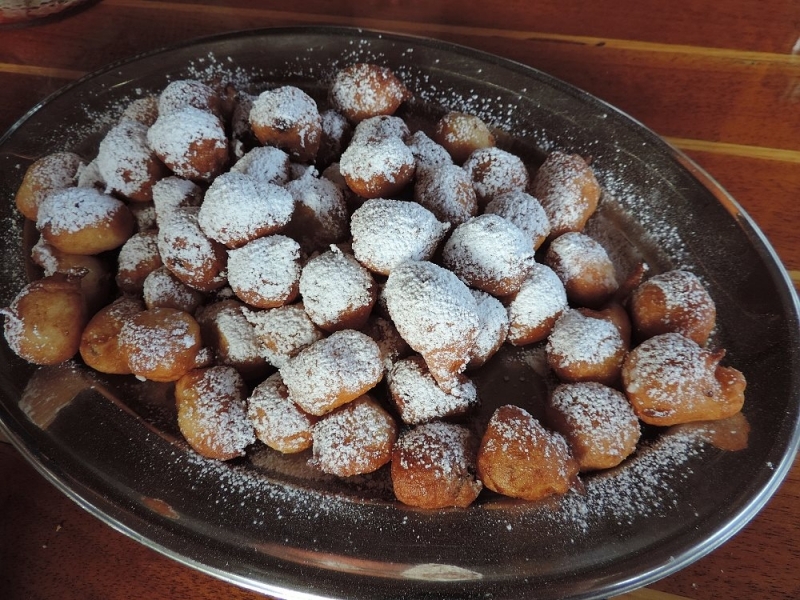 In addition to historic monuments is Jelsa famous well as ice cream sundaes. 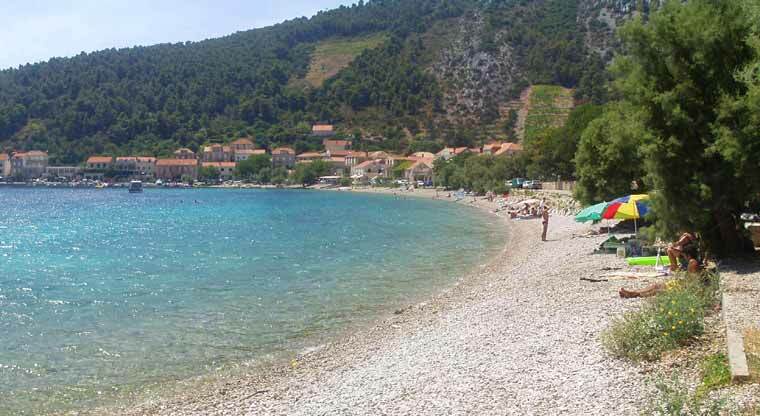 Our cruise continues towards the island Brač, where we make a short stop a tone of the famous beaches in Croatia – Zlatni rat. The last day we spend mostly relaxing and swimming in different quiet bays of the Brač island. Late afternoon we arrive to the village Postira, the typical Mediterranean place, situated on the Brač island. 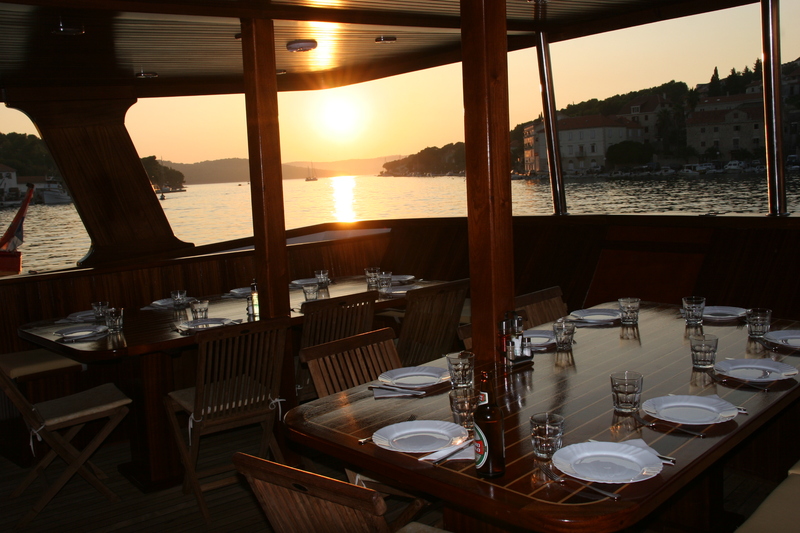 Early morning we depart the island Brač and around the island Hvar we cruise towards the Korčula island. During the day we stop in different quiet bays for swimming and bathing. 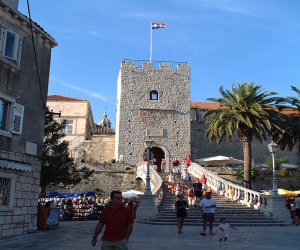 In late afternoon we arrive to Korčula, also called „small Dubrovnik“. Is the next historical pearl on our route. 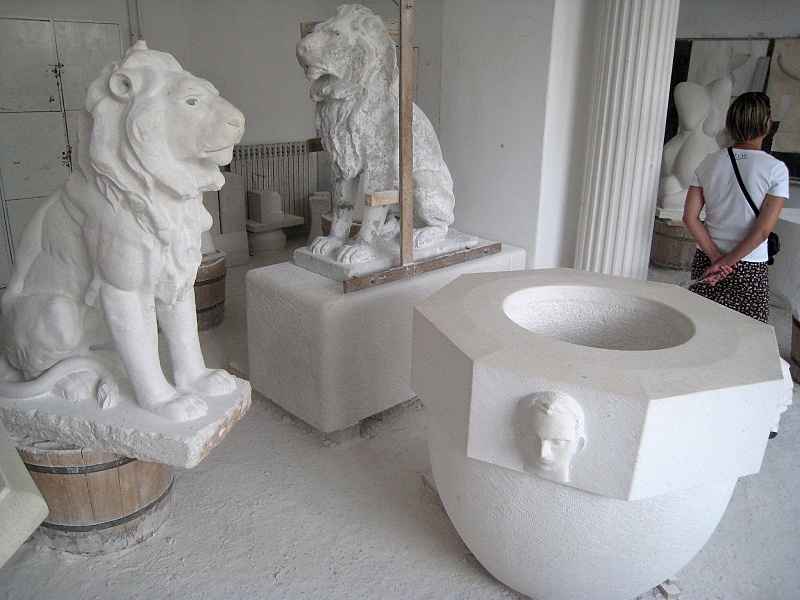 It is also the birthplace of Marco Polo. Due to town\’s hilly relief, all streets in the Old Town are created of steps that run up and down from main square and main street. Early morning we cruise towards the Elafiti islands, which offer the beautiful scenery a many romantic bays. We stop for the swimming in one of them. We arrive to Dubrovnik (port Gruž) about 2 p.m. 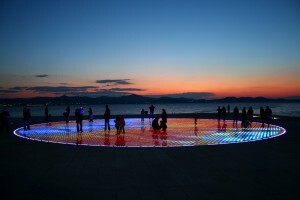 So you can explore Dubrovnik the whole evening and the night. 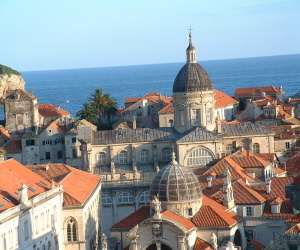 Dubrovnik is a unique town on the Adriatic, under UNESCO protection. 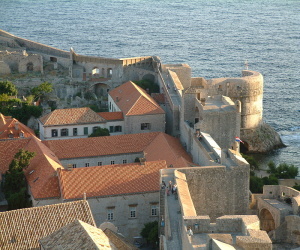 The special charm of this old city are the buildings that have remained from the time of the old Dubrovnik Republic. 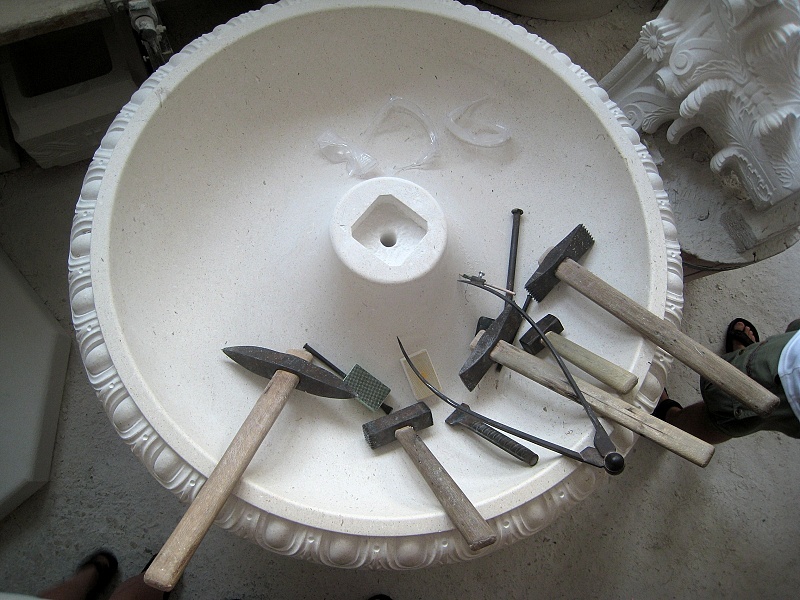 A larger part of the monuments of history and culture belong to the fine but modest Renaissance architecture with some traces of the Gothic style. We recommend a walk on the top of the city walls or the fantastic view from the hill above the old town (reach by the cable car). 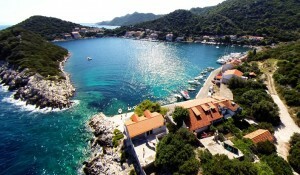 In the morning the cruise continues towards the island and national park Mljet. The whole afternoon is free to enjoy the salt lakes in the National Park and enjoy the sun and sea on this peaceful island. 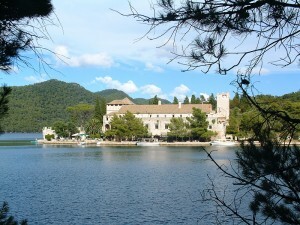 In the middle of the large lake, inside the National park, one can visit an old abbey and church, or just use a small boat to roam around the National park. Bicycles can also be hired to cycle around the paths that surround the lakes. 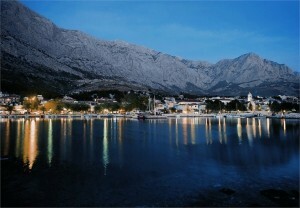 Overnight in port Polače. 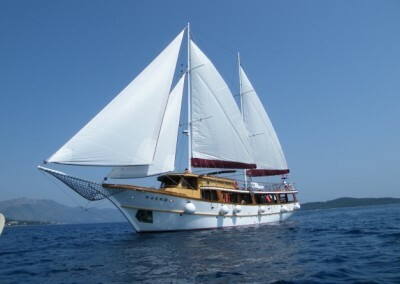 Our cruise continues towards the island Hvar. The day we spend mostly relaxing and swimming in different quiet bays, In the afternoon we stop in a beautiful bay where we spend all the afternoon and the night. Enjoy the romantic night below the stars. 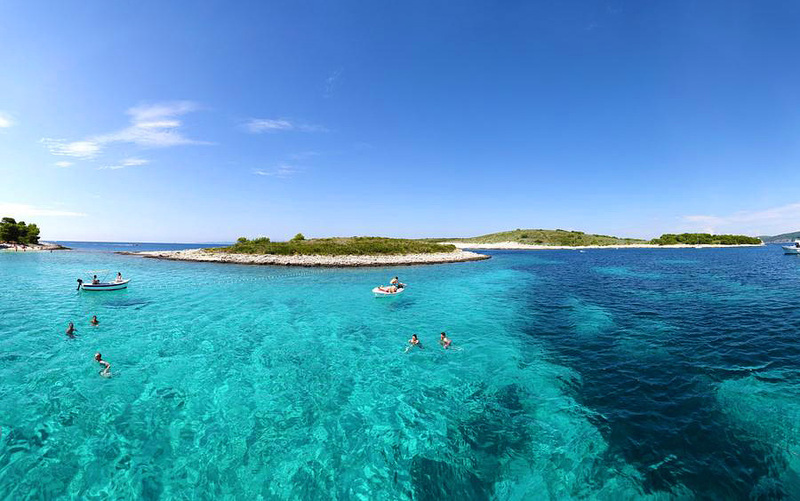 Our cruise continues towards island Brač, in the afternoon we stop for the swimming and bathing in a beautiful bay. In late afternoon we arrive to the village Pučišča in deep bay on island Brač. 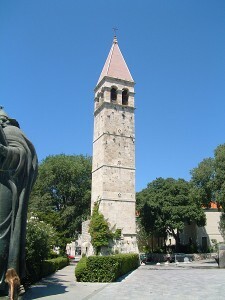 It is the cradle of world’s famous stone of Brač. 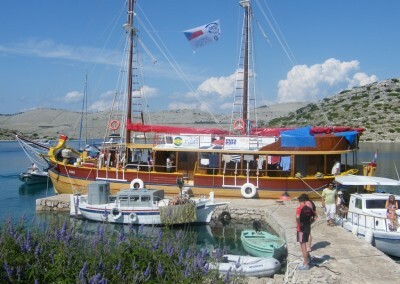 Departure from Omiš at 11:00h and than the cruising towards island Brač, with swim break in the afternoon. 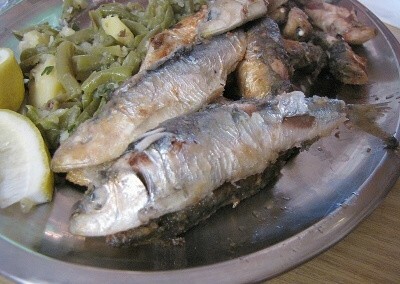 We spend the evening and the night in Postira, small fishrmans village. 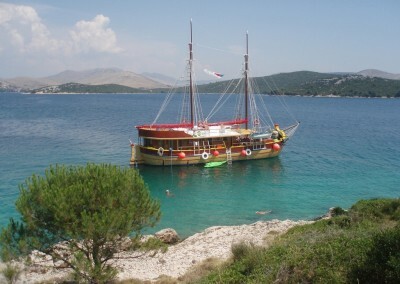 In the morning we leave Postira and continue our cruise towards the island Šolta. 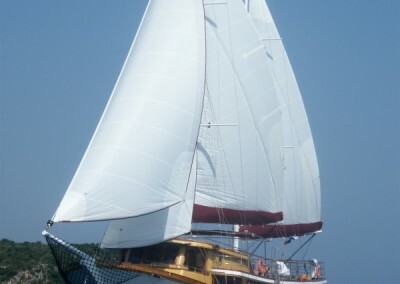 The most of the day we spend in beautiful bay and in the late aternoon we arrive to Maslinica. Maslinica is small vuillage with beautiful park. 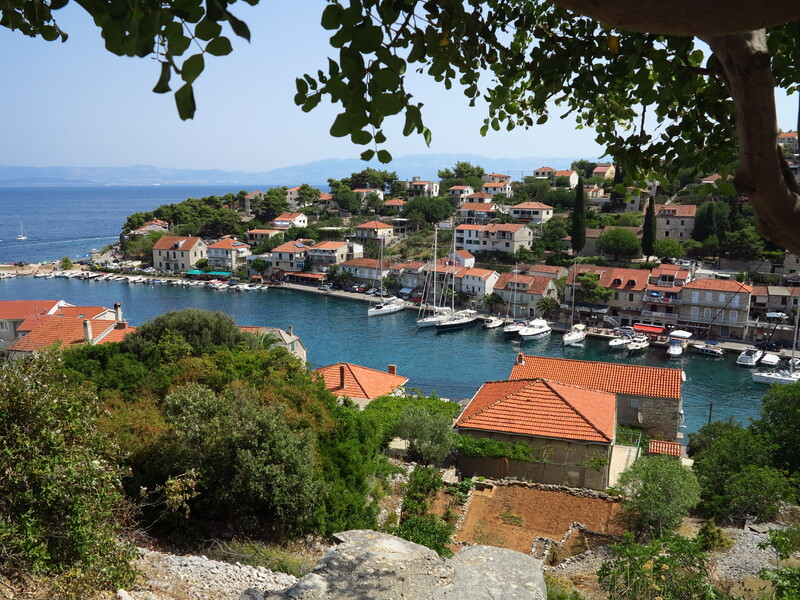 Our cruise continues around the island Šolta towards island Hvar and Brač. The most of the day and whole night we spend in beautiful bay. Enjoy the romantic night below the stars. 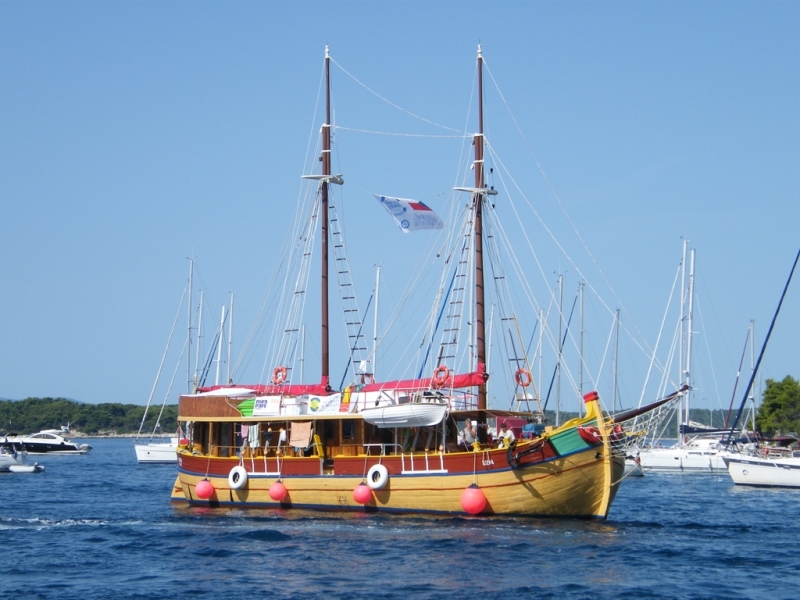 Our cruise continues around the island Hvar. 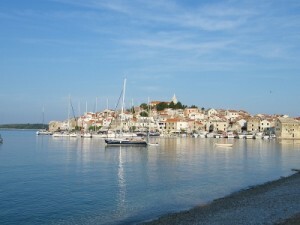 The afternoon we spend in beautiful bay at smal island Zečevo and in the late aternoon we arrive to the village Jelsa. 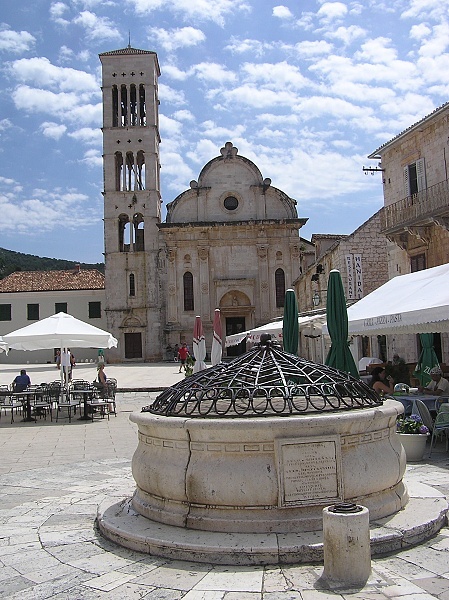 In addition to historic monuments is Jelsa famous well as ice cream sundaes. Our cruise continues towards the coastline. The most of the day we spend in beautiful bay. 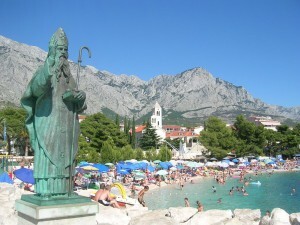 In the late aternoon we arrive to the Makarska, famous centre of Makarska riviera. 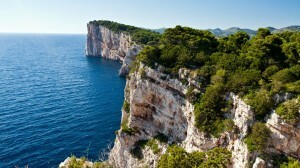 Our cruise continues towards the island Brač, the most of the day and whole night we spend in beautiful bay. Enjoy the romantic night below the stars second time. 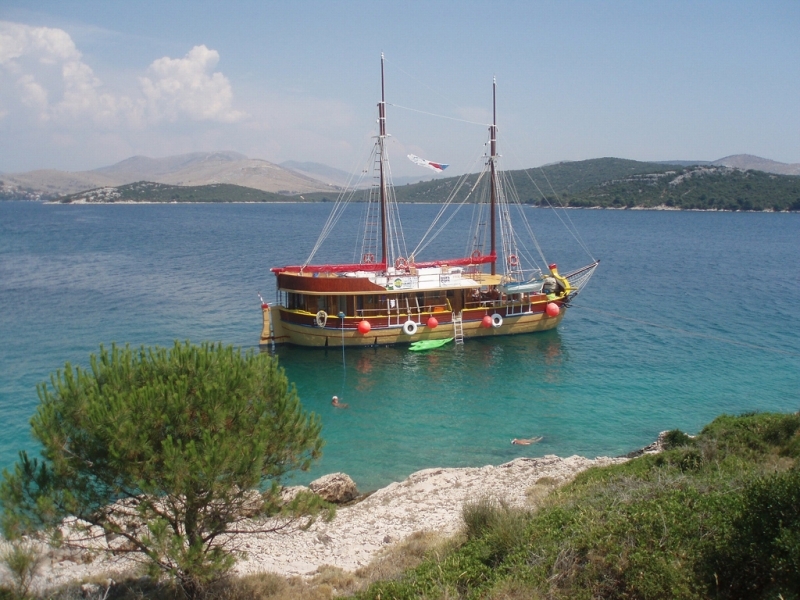 We cruise around the island Brač, we stop for the swimming and bathing in a beautiful bay. 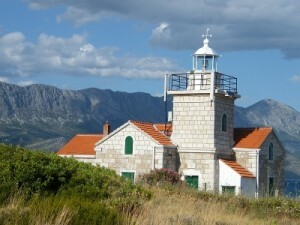 In late afternoon we arrive to the village Pučišča in deep bay on island Brač. It is the cradle of world’s famous stone of Brač. 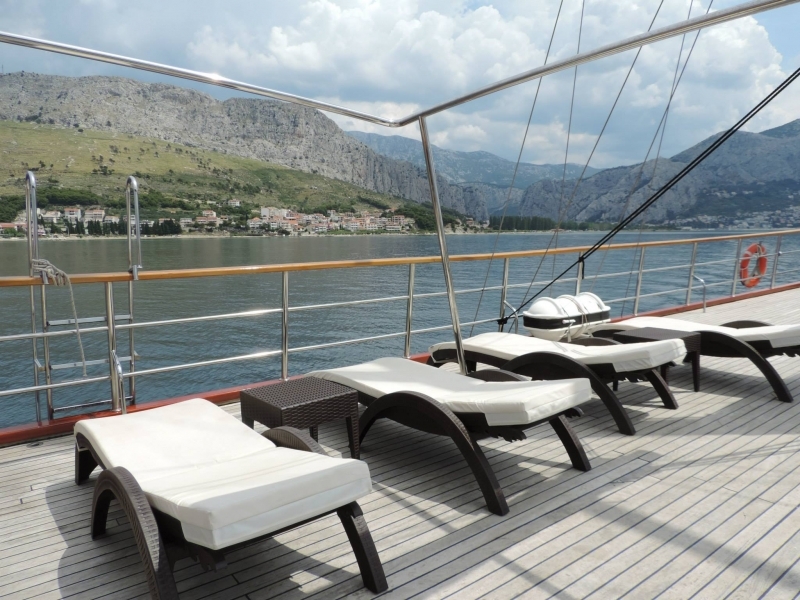 Departure from Omiš and than the cruising along Dalmatian coastline to Split with swim break in the afternoon. 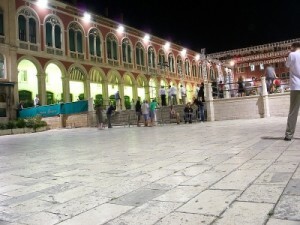 We spend the evening and the night in Split, the historical city under UNESCO protection. Lot of time for sightseeing of this beautiful town. 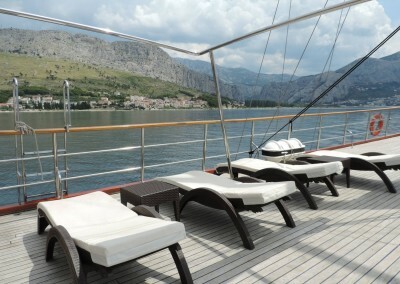 In the morning we leave Split and continue our cruise towards the island Korčula. 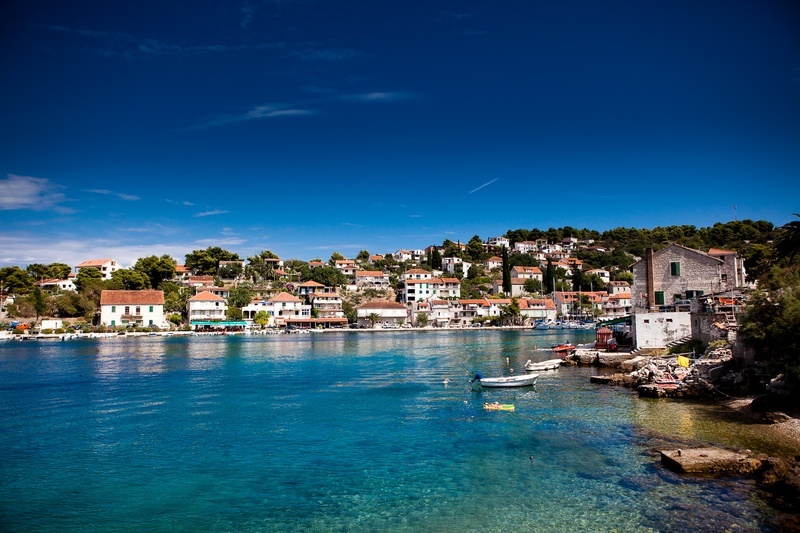 When we reach the Korčula island we make a stop for swimming and bathing in the bay. In the late afternoon we arrive to the town Vela Luka the beautiful villas, and of course with many restaurants, bars, etc. 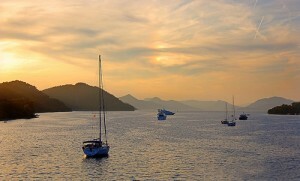 Early morning cruising towards the island Lastovo. Nature park Lastovo is one of the most preserved marine areas in the Adriatic. The captain finds out beautiful bay where we spend all the afternoon and the night. Enjoy the romantic night below the stars. In the morning we say „Good buy“ to island Lastovo and our cruise continues towards the island Korčula.The afternoon we spend in beautiful bay and in the late aternoon we arrive to the village Lumbarda. 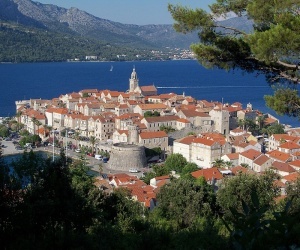 Our cruise continues around the island Korčula. During the day we stop in different quiet bays for swimming and bathing. 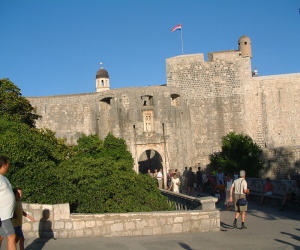 In late afternoon we arrive to Korčula, also called „small Dubrovnik“. 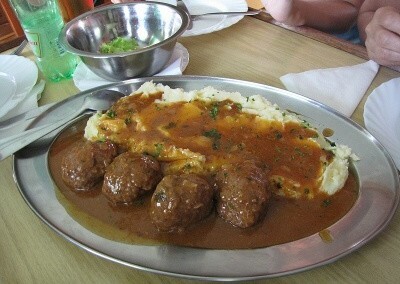 Is the next historical pearl on our route. 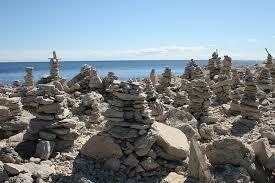 It is also the birthplace of Marco Polo. Due to town\’s hilly relief, all streets in the Old Town are created of steps that run up and down from main square and main street. 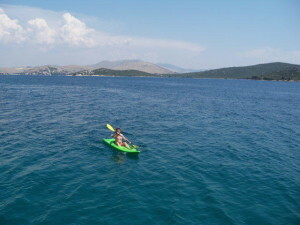 Our cruise continues towards the island Brač, in the afternoon we stop for the swimming and bathing in a beautiful bay. 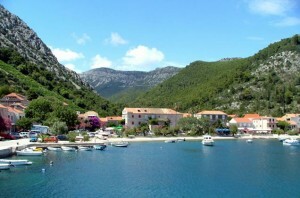 In late afternoon we arrive to the village Pučišča in deep bay on island Brač. It is the cradle of world’s famous stone of Brač. In the morning we leave Split and continue our cruise towards the islands Brač and Hvar. The captain finds out beautiful bay where we spend all the afternoon and the night. Enjoy the romantic night below the stars. 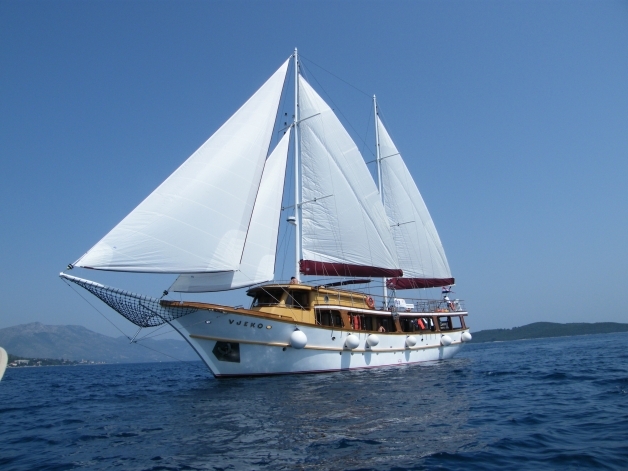 In the morning we leave the bay and our cruise continues towards the island Korčula. 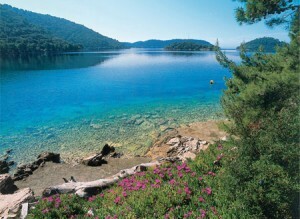 When we reach the Korčula island we make a stop for swimming and bathing in the bay. In the late afternoon we arrive to the town Vela Luka the beautiful villas, and of course with many restaurants, bars, etc. 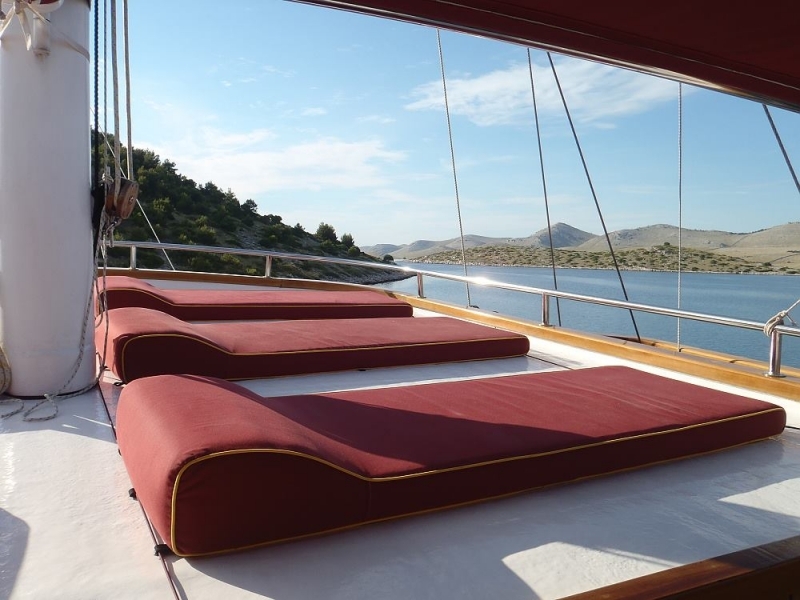 Early morning cruising towards the island Lastovo. 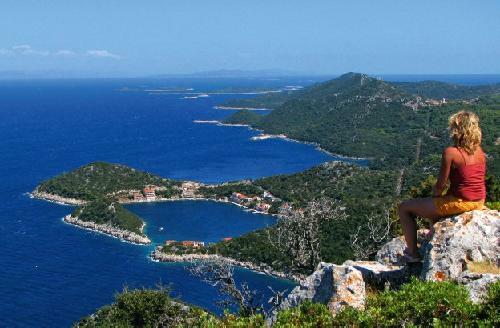 Nature park Lastovo is one of the most preserved marine areas in the Adriatic. The captain finds out beautiful bay where we spend all the afternoon. In late afternoom we move to some port at the island. 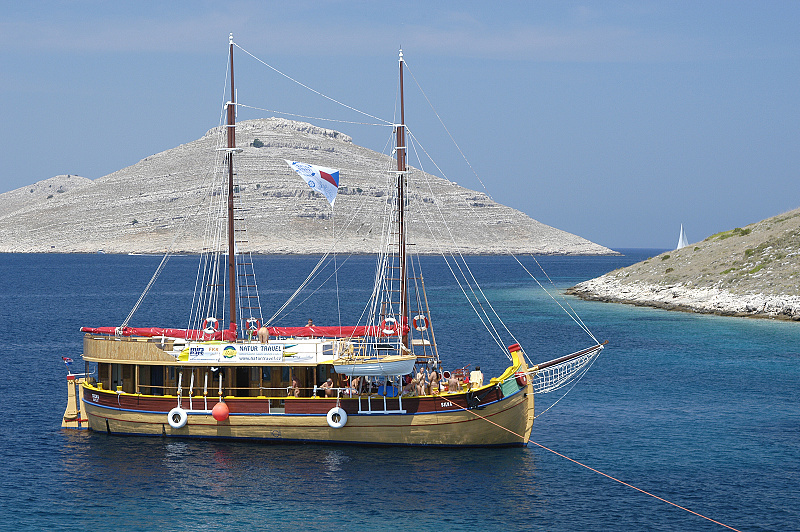 Our cruise continues around peninsula Pelješac towards the island Hvar. In the afternoon we stop in a beautiful bay where we spend all the afternoon and the night. Enjoy the romantic night below the stars. 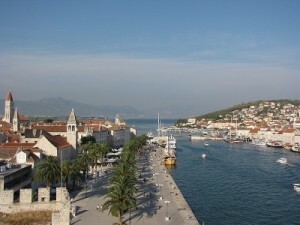 In the morning we leave Trogir and continue our cruise towards the island Šolta. The most of the day we spend in beautiful bay and in the late aternoon we arrive to Maslinica. Maslinica is small vuillage with beautiful park. 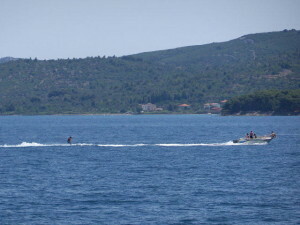 We cruise aroun the island Brač, we stop for the swimming and bathing in a beautiful bay. 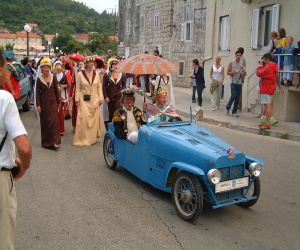 In late afternoon we arrive to the village Postira, the typical Mediterranean place, situated on the Brač island. Our motorized sailing boats are dropping anchor every day in the most beautiful bay which are inviting for a swim and bath. 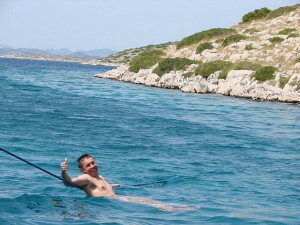 Enjoy a swim in the crystal clear water, deserted coves, ideal places for naturists holidays. 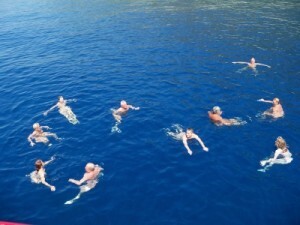 A cruise on one of our boats is certainly a unique naturists experience. 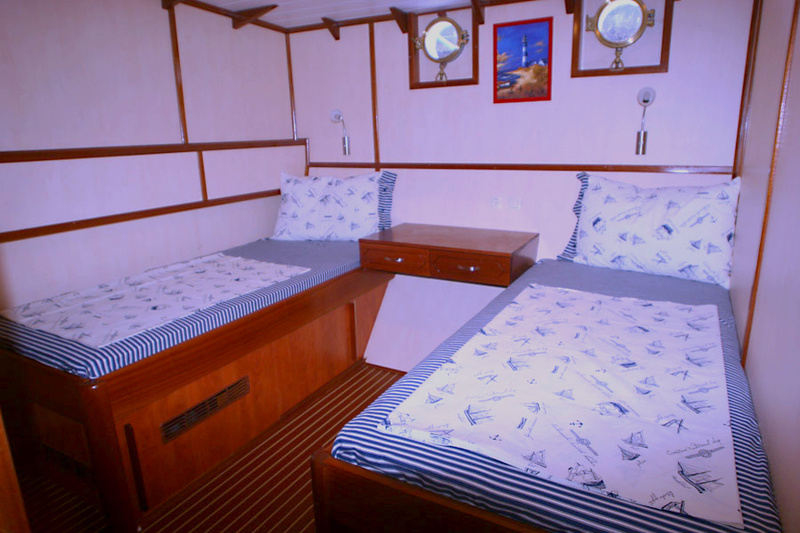 During your cruises you visit many wonderful places, historical and natural, enough time you swim in deserted coves to sunbathe on the deck. In our opinion, this is the perfect naturist holiday. 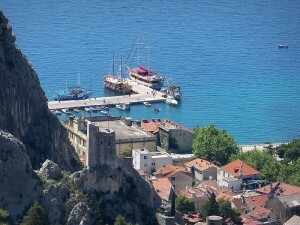 Omiš – our port for the embarkation and disembarkation. 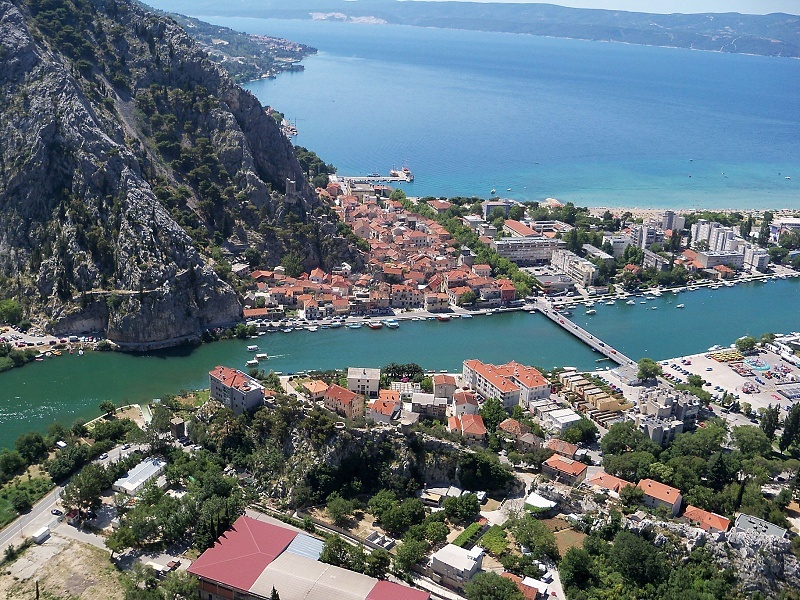 Omis in Croatia is a small Central Dalmatian town and harbour located between Split and Makarska, situated in the mouth of the Cetina river, surrounded with massive gorges. In the past Omis was notorious because of the pirates of Omiš whose ships were a centuries-long symbol of retaliation, courage and strength. 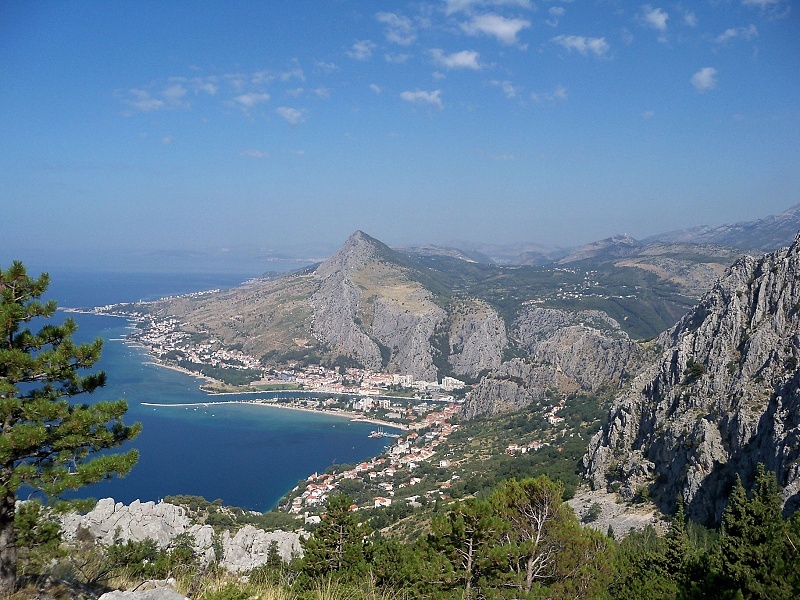 Ancient town of Omis,Omis churches and Omiš fortresses are silent stone reminders of the power and the might of infamous Omispirates. 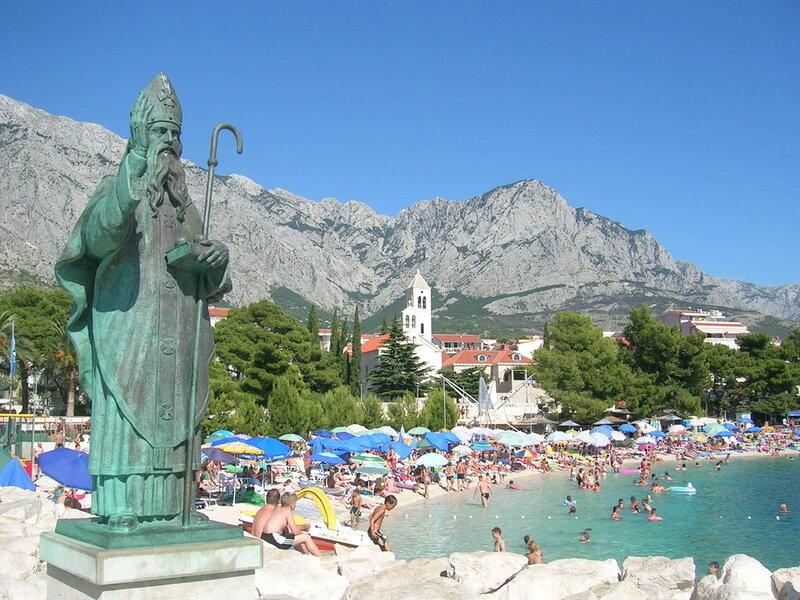 Today, it is the centre of Omis Riviera, one of the most beautiful parts of Croatia’s Adriatic Coast. The ‚Pearl of the Adriatic‘, situated on the Dalmatian coast, became an important Mediterranean sea power from the 13th century onwards. Although severely damaged by an earthquake in 1667, Dubrovnik managed to preserve its beautiful Gothic, Renaissance and Baroque churches, monasteries, palaces and fountains. Damaged again in the 1990s by armed conflict, it is now the focus of a major restoration programme co-ordinated by UNESCO. Jelsa town is a small picturesque settlement situated in a bay on the north side of the island of Hvar. Pucisca with its 1700 inhabitants is one of the greatest places on the island Brač. The town is located on the inner part of the deep retracted bay on the northern side of the island. The old city is surrounded by walls, and the streets are arranged in a herringbone pattern allowing free circulation of air but protecting against strong winds. The town’s historic sites include the central Gothic and Renaissance Cathedral of St Mark, the Town Hall and the massive city fortifications. In front of the town of Hvar there are some twenty islands and rocks called Forski škoji (Islands of Hvar), representing a vast Hvar tourist resort. For all those looking for the charming summer vacation they offer the abundance of sunny beaches, restaurants, and all kinds of other intersting places for mind and body as well. Baska Voda is a small village and port only 9km north of Makarska and just south of Brela. 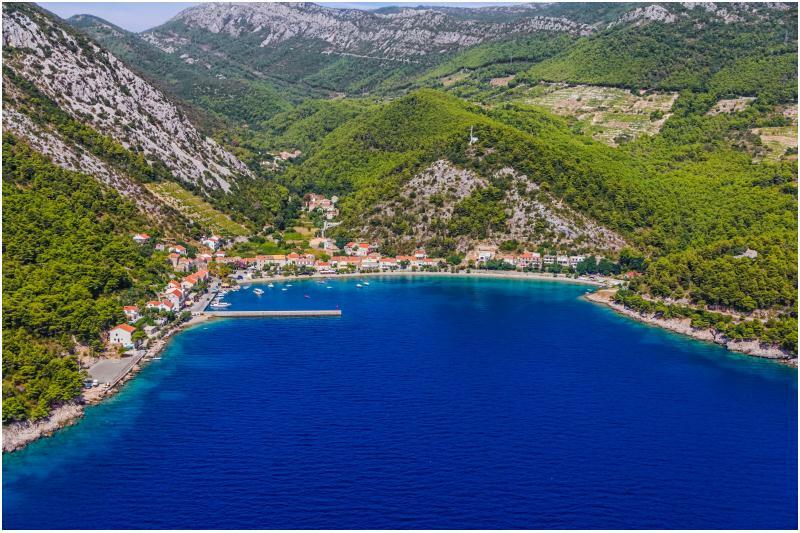 Once a humble fishing village, Baska Voda’s beaches, pine woods and lovely setting have made it a favorite for seaside tourism. 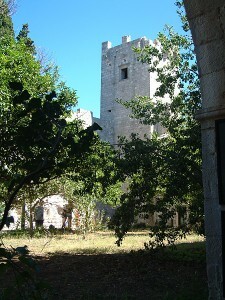 Milna is a town located in a wide bay on the western part of island Brač and 18km away from Supetar. The town developed around the Cerinić family residence. 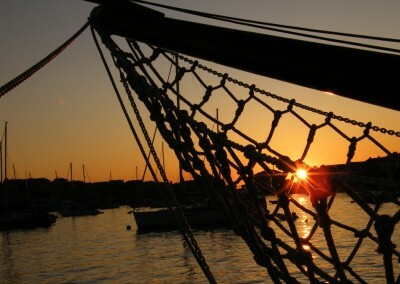 The main activities for locals are fishing, seafaring and tourism. 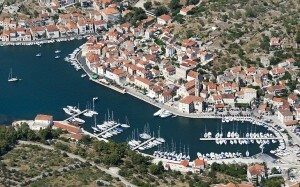 The center of the town has a large marina with many berths and modern equipment. 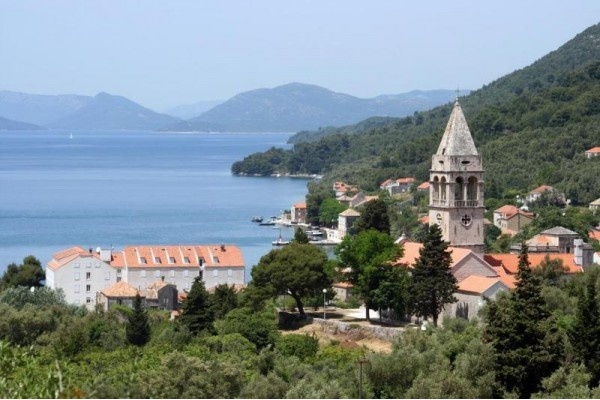 Trstenik is a village situated on the southern coast of the Peljesac peninsula.Trstenik was in 19th and beginning of 20th century important harbour for transportation of grapes from Peljesac’s isolated southern vineyards to Italy and beyond. Hvar, an ancient town with a rich history on the island in the Croatian Adriatic Sea with the same name. 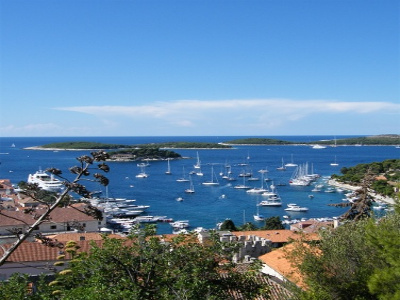 Hvar is proud that it has the most sunny hours of all the islands in the Adriatic Sea. 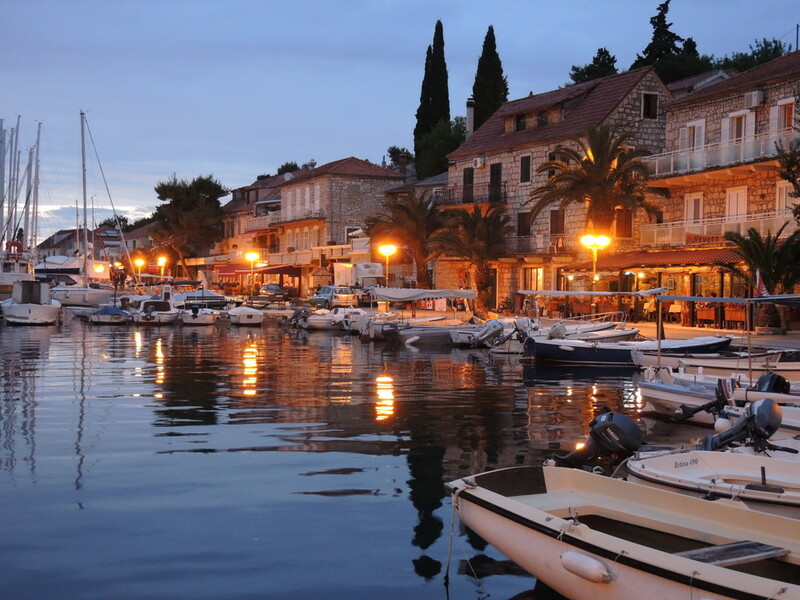 Many people say of the town Hvar that it is a town as from a fairy- tale because its arhitecture, wonderful nature and its mild climate. 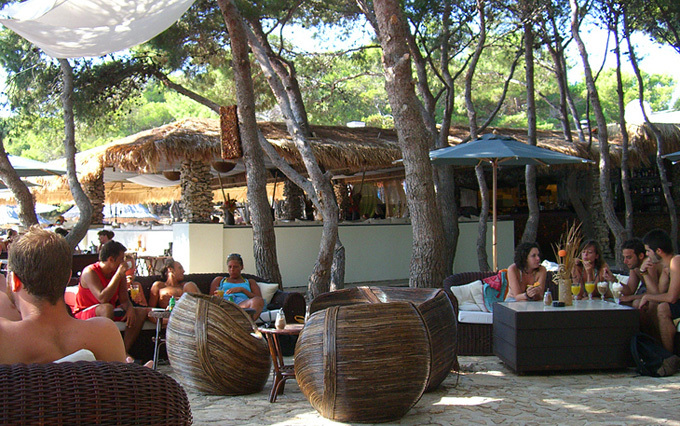 Everbody can find in Hvar all what gives peace to the soul and relaxation to he body. 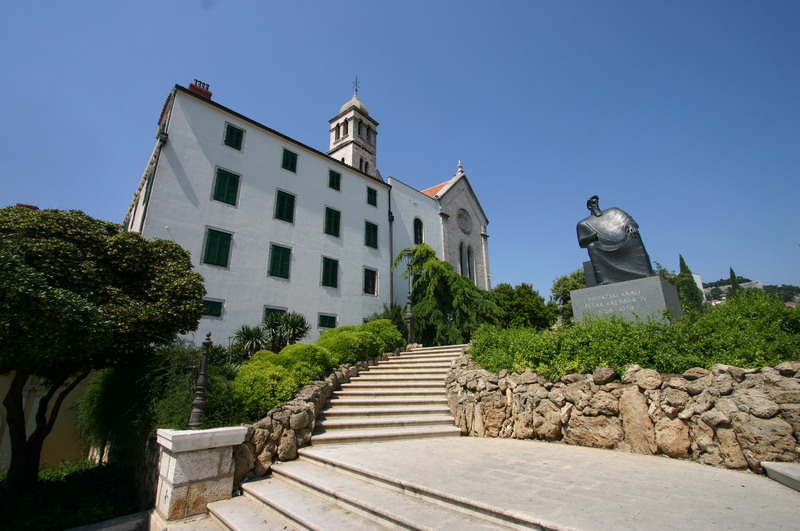 We advice you to visit the fortress Fortica (Spanjola), the cathedral of Hvar, the theatre of Hvar(established in 1612) with the arsenal and the Franciscan monastery. 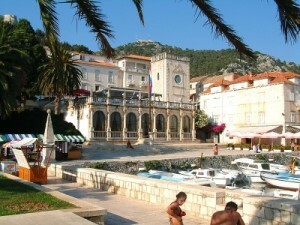 The town of Vis is located in the north-eastern part of the island Vis in the bottom of a well protected bay. It developed from the former settlements Kut and Luka, which became one entity in the 16th century by the building of the church Gospa od Spilica. 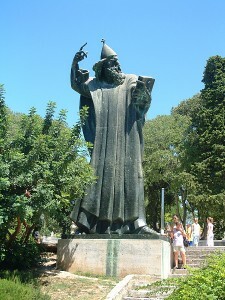 The town Vis, the antique Issa, was founded by the tyrant of Syracuse Dionisius the older about 397 B.C. 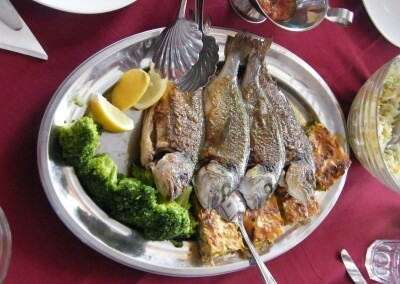 as a base for the Greek colonization of the Adriatic Sea. 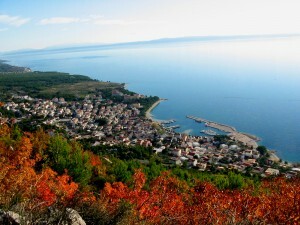 The settlement of Dionisius had been located in the part of the town, which is now called Gradina and on the peninsula of Prirovu. 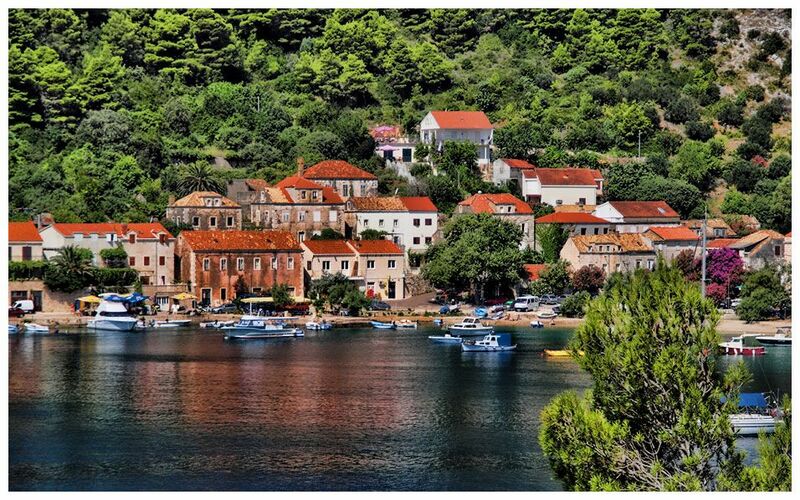 Komiza is located in a deep bay on the western side of the island Vis below the 600 meter high mountain Hum. It is a typical Mediterranean village, which attracts the tourists with beautiful beaches and with narrow roads and houses squeezed together around the harbour. The Blue Cave, one of the most extraordinary places on the Croatian coast, is located in the Balun Cove on the east side of Bisevo, a small island near to the west coast of Vis island. The cave can only be visited in small boats from the sea through a small natural opening of only 1-foot-high by less than 2 wide. Around noon, the sea is calm the sun’s rays penetrate through an underwater opening in the Blue Cave, reflect from the white floor and illuminate the cave with blue and silver objects in the water color. 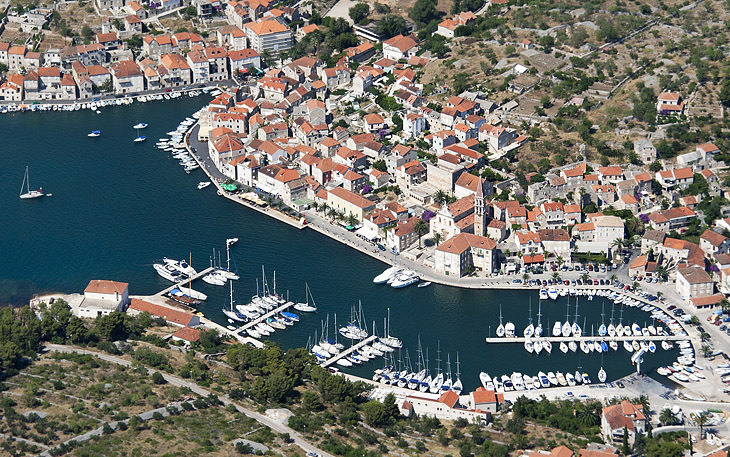 Stari Grad, one of the oldest towns in Europe, its position at the end of a long, protected bay and next to prime agricultural land has long made it attractive for human settlement. 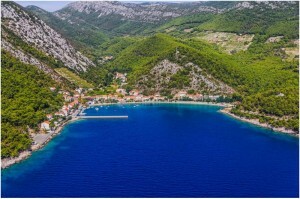 The most ancient part of Stari Grad falls within the UNESCO Protected World Heritage Site of the Stari Grad Plain, while the entire municipality lies within the surrounding buffer zone. 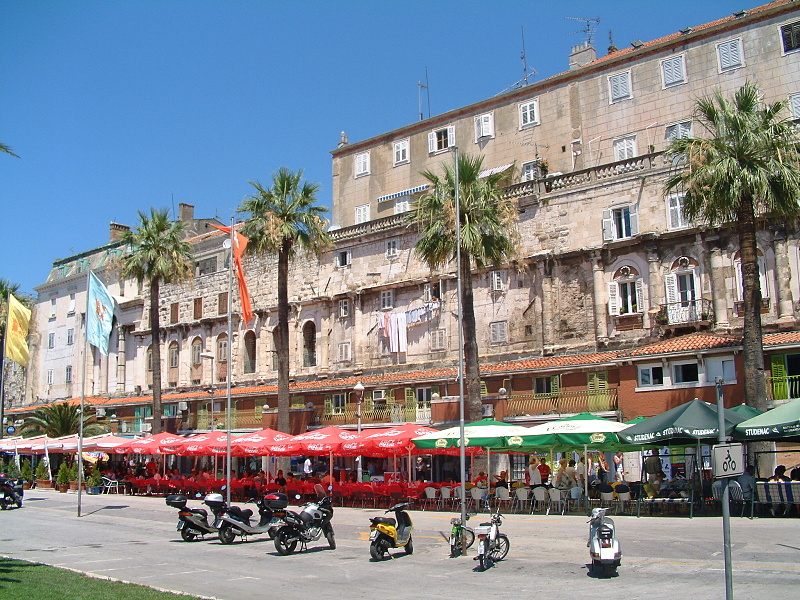 Split is one of the oldest cities in the area. While traditionally considered just over 1,700 years old, counting from the construction of Diocletian’s Palace in 305 CE, the city was in fact founded as the Greek colony of Aspálathos (Aσπάλαθος) in the 4th century BC, about 2,400 years ago. It became a prominent settlement around 650 AD, when it succeeded the ancient capital of the Roman province of Dalmatia, Salona: as after the Sack of Salona by the Avars and Slavs, the fortified Palace of Diocletian was settled by the Roman refugees. 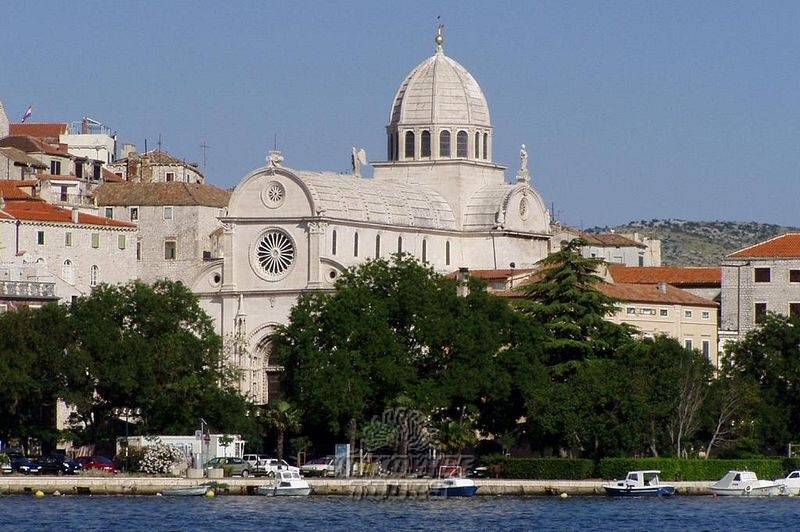 Split became a Byzantine city, to later gradually drift into the sphere of the Byzantine vassal, the Republic of Venice, and the Croatian Kingdom, with the Byzantines retaining nominal suzerainty. 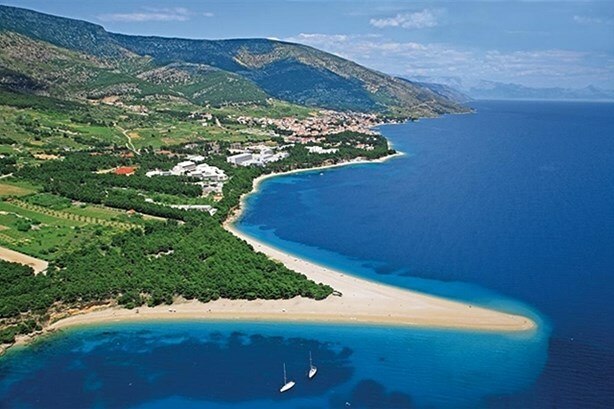 Zlatni rat is the beach situated to the west of Bol in the island of Brac. That geomorphologic natural monument is one of the biggest and most beautiful Adriatic natural attractions. It is little known that this golden tongue of gravel, which moves according to the currents and winds in turquoise blue Brac channel is a relatively recent phenomenon. 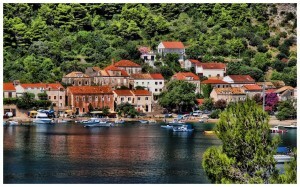 Sućuraj is a picturesque small town on the east cape of the island Hvar in Croatia. 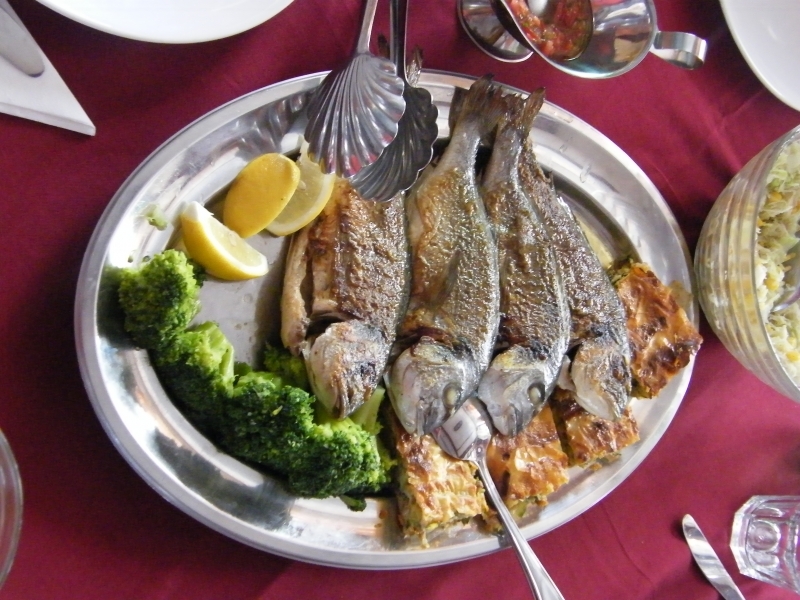 The pretty town of Sipanska Luka has a traditional Dalmatian feel, with terracotta roofed houses, marble streets and some great fish konobas (the Croatian equivalent of tavernas). Trogir is a picturesque town arranged with parks where every stone is a monument and its coast is surrounded from all sides by the sea.The wealth and the variety of its cultural heritage and the interesting history of the town are the main reasons, why the town is since 1997 under the protection of the UNESCO. 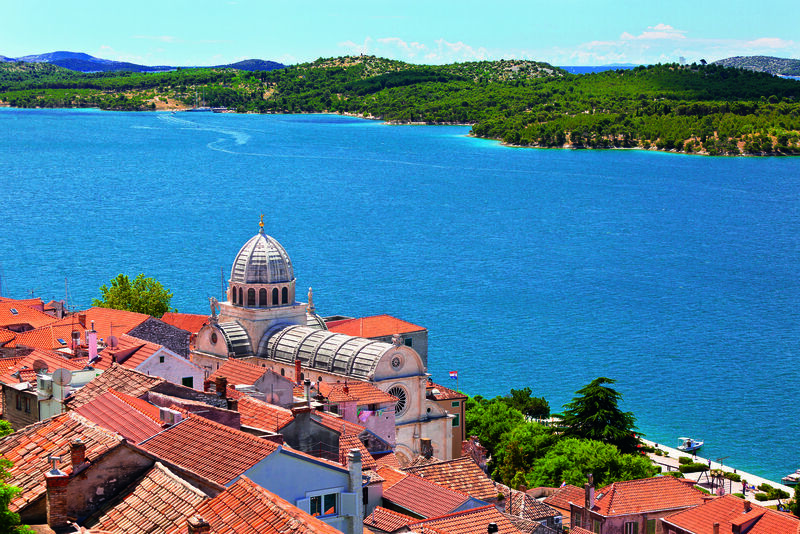 Primošten is picturesque small towns on the Adriatic, with a number of typical narrow streets in the old town core on a small, hilly peninsula. The rich cultural and historical heritage of the city is visible in the impressive Cathedral of sv. Jakov, built by the famous architect Juraj Dalmatinac and is under UNESCO protection. 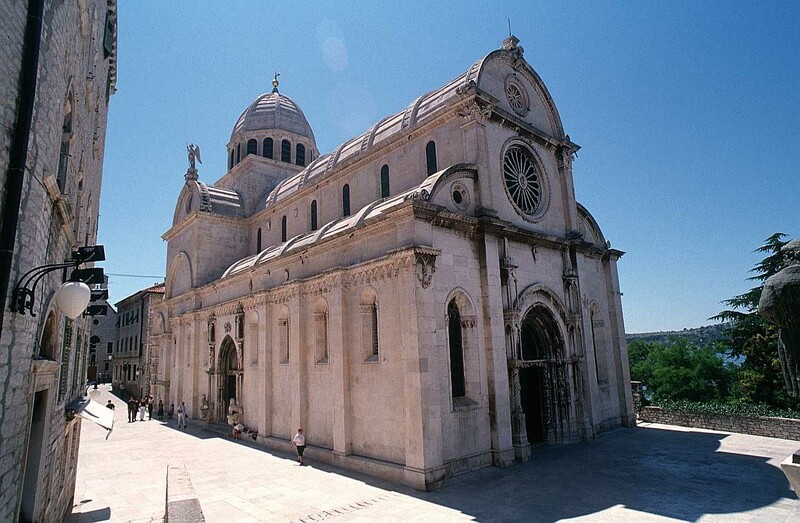 Numerous churches, monasteries, palaces and four fortresses ‚frame‘ the city, and also testify to the perseverance, renunciation and faith of generations of people of Šibenik. National park Krka is a vast and primarily unaltered area of exceptional natural value, including one or more preserved or insignificantly altered ecosystems. The purpose of the park is primarily to serve science, culture, education and recreation, while tourism activities have also been introduced for its visitors. With its seven waterfalls and a total drop in altitude of 242 m, the Krka is a natural and karst phenomenon. 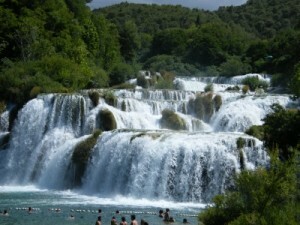 The travertine waterfalls of the Krka River are the fundamental phenomenon of this river. 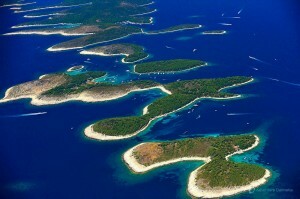 Stretching along the central part of the Croatian Adriatic, are the Kornati islands. 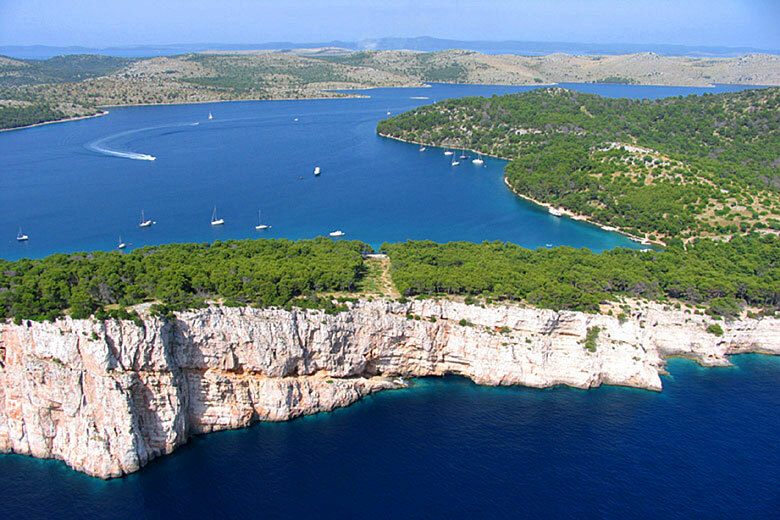 With their immense natural beauty, diverse coastlines, and preserved marine ecosystem, most of the Kornati islands were declared a National park in 1980. 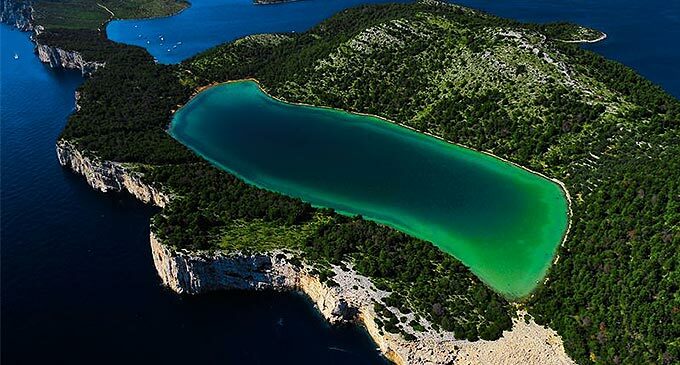 National park Kornati sizes about 220 km2 which consists of 89 islands, islets and reefs. 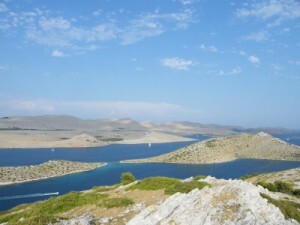 National park Kornati was named after the biggest island in the group – Kornat. Vegetation on the islands is minimal, giving the islands a bald look, however, nature still thrives with plant life on the rocks. 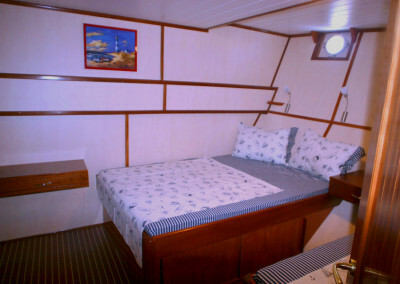 Crystal clear water, and uncover the all kinds of reefs, shellfish and many species of fish below the surface. Zlarin, another island in Sibenik Archipelago with just under 300 permanent residents and area close to 9 square kilometers. 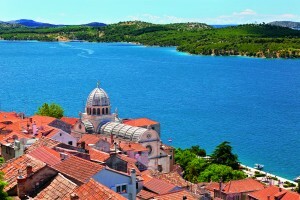 It is the third largest island in the archipelago located just 1.5 miles offshore in Sibenik channel. The island is well known for its tradition of harvesting red corals and handmade coral jewelry. 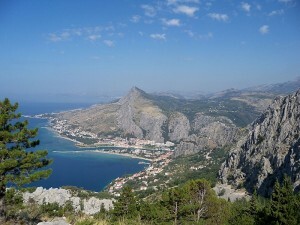 Stomorska, on the north-east side of the island Solta. It is a small village with a few hundred inhabitants. It is famous for its old sailboats and there are about dozen of them. 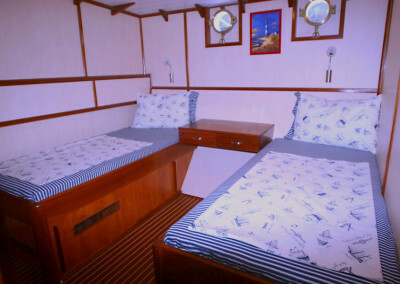 Our travel agency have organized the cruises with the traditional wooden yacht Silva around the coast and islands of Croatia from the year 1992. We have been visiting many inhabitant bays, typical Croatia fisherman’s villages and old historical towns. 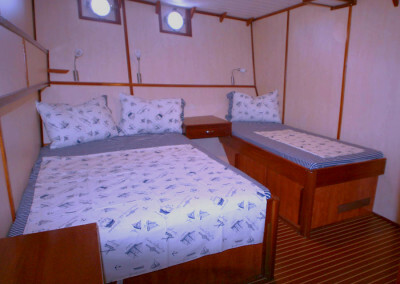 From season 2010 we have also offered the new „luxury“ motor yacht Vjeko.